Chalk Hill Chardonnay. "Offers an expansive mix of ripe fig, apricot, mango and tropical fruit, holding a rich posture on the long, layered finish. Drink now through 2020." 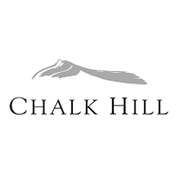 "Lemon, pastry and white rocks emerge from Chalk Hill's Chardonnay Estate. Hints of French oak and butter add complexity and nuance while not overpowering the fruit or the wine's freshness. Often referred to as the 'Catch-All Chard,' this style is appreciated by many types of Chardonnay lovers. For those who prefer the leaner styles, theEstate Chardonnay caters to their palates exhibiting aromas and flavors of lime, white flowers and stone fruit with a fresh, mouthwatering acidity. Spending 11 months in oak along with weekly battonnage, this wine has the rich, lush mouth-feel and warm spices that a fuller bodied Chardonnay drinker will appreciate. The season was considered a dream vintage that provided a rainy spring and warm, even temperatures which were perfect for growing beautiful grapes from which winemaker Lisa Bishop Forbes created a Chardonnay with the perfect balance of ripeness and elegance.